Australian Mercy has a short term project in Iraqi Kurdistan (The Duhok Governorate – population 1.3 million) Now home to nearly 98,000 Syrian Refugees and more than 450,000 internally displaced persons (IDPs) from Iraq. .
Our team, along with other ex-pats in our city have participated in several distributions for IDPs. In December 4,000 small electric heaters and extension cords were distributed to each tent in a 4,000-tent IDP camp for Yezidis located south of Duhok City. 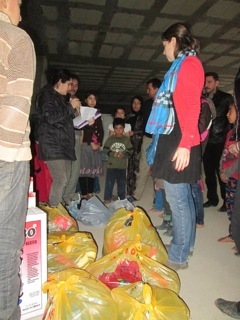 We teamed up with Samaritan’s Purse to distribute shoes and Operation Christmas Child boxes to over 600 Yezidis living in an unfinished school building in a village north of Duhok. Recently, a team member along with other ex-pats found a number of IDP families living in an unfinished building in the city. They did a needs assessment, purchased the items from the city market, and distributed the items. Another team member has been visiting a roadside settlement of Yezidis on a weekly basis to help provide an educational program for the children. According to reports, most winterization needs have been met, however there is an ongoing need for food parcels, clothes, medical care, counselling and education of children. We are in the beginning phase of planning and determining how to partner with others to train young people to work with traumatized children in the refugee and IDP camps.